Spruce refers to trees of the genus Picea. They are found in the northern temperate and boreal (taiga) regions of North America. I include ranges of six species that are commonly found and have some silvicultural interest. Spruces can be distinguished from firs by their down-hanging cones. Fir cones stand upward and on top of branches. Fir cones disintegrate on the tree while spruce cones fall to the ground. 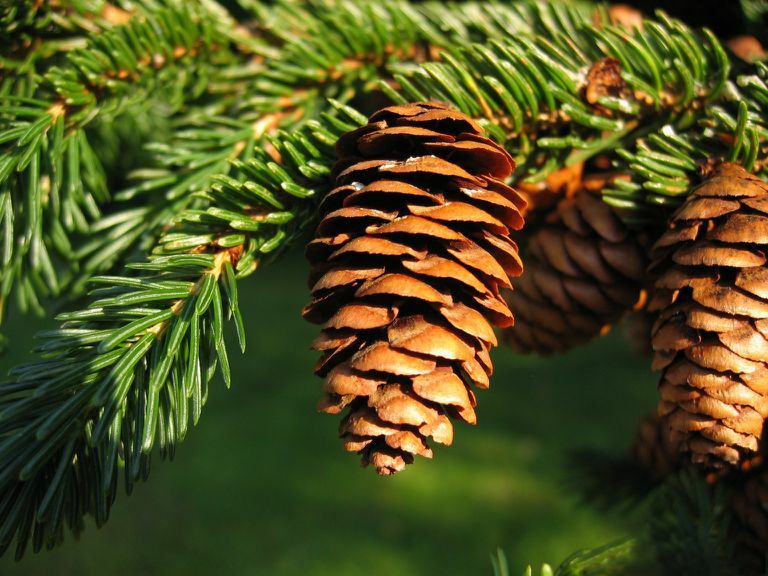 Fir needles are rather flat and two-ranked along branches while spruce needles are whorled around the branches. (Picea rubens) is a common forest tree of the Acadian Forest Region. It is a tree that prefers rich moist sites in mixed conditions and will dominate in a mature forest. Picea rubens habitat ranges from Maritime Canada south and down the Appalachians to western North Carolina. Red Spruce is the provincial tree of Nova Scotia. Red Spruce does best on moist, sandy loam soils but also occurs in bogs and on upper, dry rocky slopes. Picea rubens is one of the most important commercial conifers in the northeastern United States and adjacent Canada. It is a medium-size tree that may grow to be more than 400 years old. Colorado Blue Spruce (Picea pungens) has a horizontal branching habit and grows taller than 75 feet in its native habitat, but is normally seen at 30 to 50 feet in landscapes. The tree grows about twelve inches per year once established but may grow slower for several years following transplanting. Needles emerge as a soft clump, changing to a stiff, pointed needle sharp to the touch. The crown form varies from columnar to pyramidal, ranging from 10 to 20 feet in diameter. Colorado Blue Spruce is a popular landscaping tree and lends a formal effect to any landscape due to the stiff, horizontal branches, and blue foliage. It is often used as a specimen or as a screen planted 10 to 15 feet apart. Black spruce (Picea mariana), also called bog spruce, swamp spruce, and shortleaf black spruce, is a wide-ranging, abundant conifer that bounds the northern limit of trees in North America. Its wood is yellow-white in color, relatively light in weight, and strong. Black spruce is the most important pulpwood species of Canada and is also commercially important in the Lake States, especially Minnesota. White spruce (Picea glauca), also known as Canadian spruce, skunk spruce, cat spruce, Black Hills spruce, western white spruce, Alberta white spruce, and Porsild spruce. This wide-ranging spruce has adapted to a variety of soils and climatic conditions of the Northern Coniferous Forest. The wood of white spruce is light, ​straight-grained, and resilient. It is used primarily for pulpwood and as lumber for general construction. Sitka spruce (Picea sitchensis), known also as tideland spruce, coast spruce, and yellow spruce, is the largest of the world's spruces and is one of the most prominent forest trees in stands along the northwest coast of North America. This coastal species is seldom found far from coastal areas, where moist maritime air and summer fogs help to maintain humid conditions necessary for growth. Throughout most of its range from northern California to Alaska, Sitka spruce is associated with western hemlock (Tsuga heterophylla) in dense stands where growth rates are among the highest in North America. It is a valuable commercial timber species for lumber, pulp, and many special uses. Engelmann spruce (Picea engelmannii) is widely distributed in the western United States and two provinces in Canada. Its range extends from British Columbia and Alberta, Canada, south through all western states to New Mexico and Arizona. In the Pacific Northwest, Engelmann spruce grows along the east slope of the Coast Range from ​west central British Columbia, south along the crest and east slope of the Cascades through Washington and Oregon to northern California. It is a minor component of these high-elevation forests.